Let’s face it, work can be frustrating. We may not feel appreciated, paid enough, or though others work as hard as we do. You may also feel as though you are not making much of a difference in the world with your line of work, and as though you could be doing much more for the Lord. These are all feelings we have probably felt one time or another; or might even still be wrestling with. The church in Colossia had a mixed group of members; some of them were even slaves. Paul specifically addresses the slaves in today’s verses. He tells them to work heartily because they are really working for the Lord. Think about this for a minute and let it sink in. Remember today that, no matter what you do for a living, you are working for the Lord! You don’t have to be a missionary or a staff member at a church. Where you are right now can be used to is serve the King of kings, and Lord of lords. The reason we can say this, and be joyful in this, is because our reward is not a promotion or pay raise. Our reward isn’t being employee of the month or a bonus. Our reward is our inheritance with the saints in Heaven (Colossians 1:12). This reward can never be taken away, and has much more value than anything that could ever be purchased here on earth. When you just want to quit or stop doing your job, remember today’s verses. Stop and say a prayer and thank Jesus for making a way for you to have the ultimate inheritance through His death on the cross. Take a few deep breaths and remember that you aren’t working for men but for the greatest boss ever, Jesus. Whether you are a stay at home mom or CEO, remember who you are working for today. Which God do you refer to, the God of the Bible? The same God that commands we stay involved with His Church in a body of believers to encourage one another and make sure we’re staying true to His Word? (Hebrews 10:23-25 ESV) How have you learned about God, through trial and error, personal experiences, or observing others (who may or may not be true followers)? When you do read the Bible, do you understand what you’re reading? Do you comprehend the overall message? How do you know you’re interpreting it correctly? Can you tell the difference between historical narrative, poetry, prophecy, or wisdom literature? I’d ask him how he knows I’M not leading him astray. In other words, what’s he anchored to, the Word, or his subjective experience and opinion? I’d ask him this to make the point that there are no “Lone Ranger” Christians. Nobody gets to go it alone and make up whatever version of Christianity suits them. Christianity is a team sport; it must be lived in concert with other followers to ensure we haven’t strayed from the true faith. Dear Lord, I want to know you fully as you know me fully. I don’t simply want to know about you, I want a personal relationship with you so that you can live through me. I want you to be the first one I run to when trouble comes, not a last resort as some do. Amen. Spend some time today thinking about your relationship with God. Is He some mysterious figure you go to church to learn about and to get some spiritual sounding nugget to get you through the week? Or do you long to know Him as Father, and worship with a body of fellow believers, perhaps even serve them in some way? I had a pastor tell me years ago, “Crystal, you should be in church every time these doors are open.” I remember getting mad at him thinking, “Who does he think he is? !” Well, now I understand. He thought he was my pastor, watching over my soul; he knew my struggles and knew the best place for me to overcome was being consistently around the things and people of God. I see it now as a pastor that those who struggle the most are inconsistent with church attendance. They are inconsistent with Bible study and prayer group. They are inconsistent with small groups and so they struggle and are up and down in their emotions like a yoyo. If you neglect the Body, you become weaker not stronger and are more susceptible to deception and the schemes of Satan. If you are struggling and are constantly up and down, immerse yourself in the things of God. Stop skipping corporate worship, the Word is going forth and you’re missing that time of praise and fellowship when His presence is so strong. Go to Bible Study and prayer group. It’s more important than Monday Night Football. Your faith is more precious than gold! Father, we are not those who walk in darkness, but are children of the Light! Help us walk side by side with our brothers in Christ for we are stronger together! In Jesus’ name. Each Wednesday, starting tomorrow evening, April 26th, we will have a dinner by donation at 6:00 PM and at 6:30 PM Care Network Training will begin in the Auditorium. Care Network Training will help us learn to serve the emotional, spiritual, and physical needs of those who find themselves in difficult situations. Come discover how you can use your spiritual gifts to care for this church and community. We will be serving dinner from El Ranchero starting at 6:00 PM. Care Network Training will begin at 6:30 PM. ALP is committed to providing caring, professionally trained, literacy tutors to students in our community who struggle with reading and whose families cannot afford to pay. Please help us train more tutors by supporting our Mother's Day fundraiser initiative. For a suggested donation of $20, a Mother's Day card, illustrated by an Augustine student, will be mailed in the donor's name. To place your order, visit www.augustine-brevard.org. Pastor Stanley Metcalf, Executive Pastor at Brevard Community Church, is transitioning to the next step in his spiritual journey. He and Debbie will be on mission in Thailand starting in August. Please join us in thanking them for the sacrifices they have made to further God's Kingdom after first and second service in the Brown House on Sunday, April 30th. 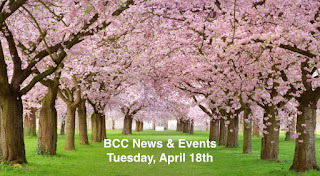 B@B is for first time guests, individuals interested in membership, or anyone wanting to know more about BCC. It is designed to give you a chance to hear the vision and values of BCC. You can get familiar with WHO we are, WHERE we're headed, WHY it's important, and HOW you can get in on it. A brief 15 minute session will be offered immediately after first and second service in the brown house, directly across from the auditorium on Sunday, May 7th. Children are welcome. In the beginning of Jesus’ ministry, he calls the first disciples and tells them they will be fishers of men (Matthew 4:18-19). At the end of his ministry here on the Earth, the last command he gives them is to make disciples of all nations (Matthew 28:18-20). As we read these, we can imagine that these commands were only for the disciples, or those who have been called specifically by God to grow the church. You might not even know what a disciple is or how to become a disciple; you figure the guy at church who is in charge of evangelism does that stuff. In Acts, the book of the early church, there arose a great persecution in Jerusalem (8:1). God was doing awesome things through the disciples and people weren’t liking it. Acts 8:4 tells us that those who were scattered because of the persecution just kept preaching and growing the church. They were the ones going to Judea and Samaria, as Jesus said they would be in Acts 1:8. But, they weren’t the disciples. They weren’t the guys who Jesus said he would make fishers of men and commanded to make disciples. They weren’t the men who spent three years with Jesus on the Earth. The disciples stayed in Jerusalem (Acts 8:1) and the average Joe like you and me went out and made disciples. The command to make disciples wasn’t just for a certain group of people, but for every Christian. The early church would have never grown as fast as it did if the first Christians thought it was the job of the disciples to do the disciple making. It also isn’t just the job of paid clergy today. Disciple making is the job of every believer. From our modern perspective it’s very easy to think of the church as a building made of steel, wood, bricks, and mortar. When the New Testament speaks of the church, it is always talking about people. In fact, the earliest evidence of a house being converted architecturally into a place of Christian worship is not until approximately 241-256 AD. In Peter’s description of the church, he describes people as “living stones” who are “built up as a spiritual house” with Jesus as the “cornerstone.” From Peter’s perspective, the church is not so much a physical building or even an institution but people that God is developing and bringing together in Jesus. It’s important to remember that what makes us as “living stones” fit together in a cohesive unit is making sure that the cornerstone is in place. In the construction of a building, the cornerstone is set first in the foundation and all the other stones are positioned in reference to this stone. If the cornerstone is weak or not set in the right place, everything else in the building will be off. How we view the church influences greatly how we approach ministry. Our goal can quickly become building bigger facilities or growing an institution instead of developing people who love and follow Jesus. It is vitally important that the church you call home is built on the only foundation that can stand, Jesus. When you think about church do you think of a building, an institution, or people? How does this influence the way you view ministry and the purpose of the church? Most relationships are based upon the notion of “give and take”. For example, Jeff holds value to Pete, because Jeff knows everything there is to know about electronics. So, when Pete calls Jeff to ask him about which home theater system to buy, he also feels guilty about only calling to get information from him, so he asks him to coffee as an afterthought. While this isn’t necessarily bad, it can exemplify the shallowness of many of our friendships. Let’s take it a step further: Do you have that friend who always wants something from you, but never gives back anything in return? Maybe you’re their “go-to” when they have yet another problem or need a favor? Most likely you can picture that person now. It’s always something, and it’s always about them; you are their faithful product and they your constant customer. But what if there was someone who gave everything for you without expecting anything in return? Someone who didn’t take advantage of you but loved you? Jesus has done just that. He came into this world fully knowing that there was nothing He could get from us that He couldn’t get better from Himself, but He still gave His life “as a ransom for many”. Jesus didn’t come to this earth in order to exploit us, but to serve us. Approach Jesus in gratitude knowing that He isn’t like our fallen friends. He never came to take, but to give this Easter. We will have identical services on Thursdays at 7:30 PM (starting this Thursday, April 20th) and on Sundays at 9:30 and 11:30 AM. Everything at BCC is designed with you in mind. You can expect a warm welcome from friendly faces, environments for every age, engaging worship, relevant messages, and individuals striving to make a difference. Thank you for your effort in praying and preparing for Easter. It was awesome to celebrate the Risen Savior. 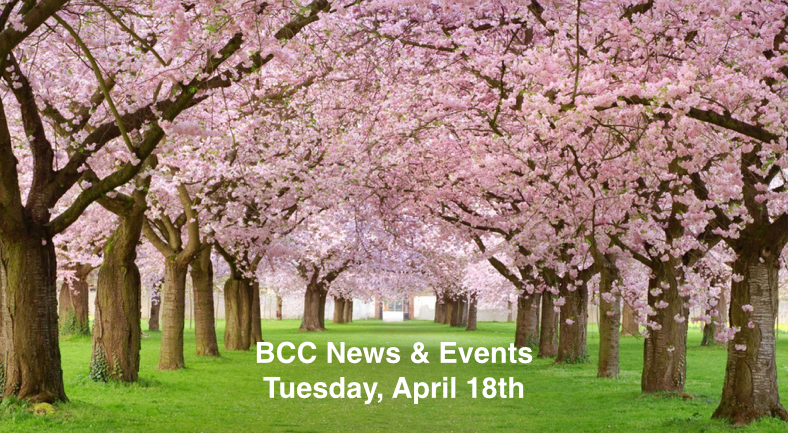 This Wednesday, April 19th we will not meet but there are still many opportunities to serve in the future. Care Network Training will begin next Wednesday, April 26th. Dinner by donation will start at 6:00 PM and Care Network Training will begin at 6:30 PM. We all have our own picture of what church looks like. For some, it may include pews and old hymns. For others, it might include worship music and a speaker in a coffee shop on a Sunday night. But, what if we told you that church wasn't a meeting place or an environment. The church is a place where you feel like you belong. It is a place where you find a community of people who will support and accept you throughout your life. It is a place so compelling that there is no choice but to experience the love of God and share it with others. Join us for a new series as we unpack what should make church compelling. The church office will be closed beginning on Fridays starting this Friday, April 21st. What does it look like when you’re called to follow God, but life is still hard? This may be the theme of your day, your week, your month, or even your year. Life is painful and life is trying; however, when we understand the hope of the cross, we see that there is more to life than the things we’re feeling now. In the days leading up to Easter, the disciples may have been unsure of what was coming, but they were sure of who they were following. They knew that Jesus was to fulfill all the things that He had told them, and so they held on to that, even to the point of His death on the cross. Christ was denied three times by one of His own. He was given over to His accusers, He was beaten and mocked, and He was hung on a cross to prove to the world that He is who He says He is. At that time, that truth didn’t ring through, because all we saw was the cross. Sometimes, we see our sin and our human nature and don’t understand how a God who created everything we see, and everything we know, can love us still; we surely can’t understand how Jesus would willingly volunteer to take our place. However, that’s the beauty of that cross. That Jesus went, He died, and He promised that moment would not be the end. When we look at all that is revealed in scripture, we know that it cannot be the end. When we feel hopeless, we must remember the monumental truth from three days later – Jesus rose and is living. He never fails, He is always constant, and He is forever powerful. We are chosen because of the great love that God has for us; and that love will sustain us through our darkest days. In your struggle, remember that God loves you. He knows your innermost failings and He sees through all of it; cling today to the hope that you have in Jesus. After His resurrection, Jesus visited with His disciples and instructed them for forty days before ascending into heaven (Luke 24:36–49; John 21; Acts 1:1–11). The only event Matthew records following the resurrection, besides the payoff of the Roman guards (28:11–15), is the commission Christ gave His followers on a mountain in Galilee (vv. 16–20). We are not sure when this event occurred during those forty days, but its precise chronological placement is unimportant. Apparently, our Lord told His followers to meet Him in Galilee after His resurrection, and the eleven remaining disciples found Him there (vv. 10, 16). Seeing Christ, many of them worshiped Him, though others doubted (v. 17). This doubt, however, is not to be confused with rejection. Distazein, the Greek verb translated “doubted,” reflects hesitation, not a refusal of truth. The doubting disciples did not doubt whether or not Jesus was the Messiah, they were just unsure how to respond to Him. Being notoriously slow to understand, it may be that some of them had not yet come to grips with the fact that Jesus was (and is) the incarnate God Himself. In Galilee Jesus announced that all authority in heaven and earth was given to Him in His resurrection (28:18). Vindicated as God’s spotless lamb, the atonement for the sins of His people, the Father makes plain even today to all with eyes to see that His Son is the Messiah — whose kingdom has no end. Seated at God’s right hand, the Christ exercises His dominion, subduing His enemies through the preaching of the gospel, proving that He, the God-man, received the name above all names in His resurrection (Phil. 2:5–11; Heb. 1:1–4). John Calvin comments that by nothing other than divine authority could Jesus “command us to promise eternal life in his name, to reduce the whole world under his sway, and to publish a doctrine which subdues all pride, and lays prostrate the whole of the human race.” Only the authority of God Almighty, revealed to us in Jesus and with us by the Holy Spirit, enables us to obey the Great Commission, teaching people to cast off self-reliance and put all their hope for salvation in Jesus alone (Matt. 28:18–20). According to His promise, Christ is with us to the end of the age; thus, we may confidently go forth to fulfill the Great Commission, knowing that He will ensure its success. What is your role in His plan? Are you a gifted teacher who builds up disciples? Do your talents lie in producing goods that enable people to be sent? Are you sharing the gospel with friends and family? Let us go out and obey Christ’s command to take the gospel to the ends of the earth. One of the most effective tools the enemy will use to keep you from serving God is convincing you that you’ve either messed up too much to serve God or that you must clean up your life before you can get God’s attention. When these thoughts pop into your head, sniff the air for the scent of sulfur, because they are lies straight from the fires of hell! God’s intention when he convicts us of our sins is not to condemn us; rather his breath of life disperses that satanic smoke the father of lies uses to keep us on the run from God. If you follow the sequence of Isaiah 6, you’ll see how God initiates the process that brings you into his holy presence and purifies you to remain in his presence, and that your new guilt-free, sin-atoned status will compel you and prepare you for the unique mission God sets before you. Yet God’s intention when he convicts us of our sins is not to condemn us; rather his breath of life disperses the “fog of war”—that satanic smoke the father of lies uses to keep us on the run from God. Isaiah reports that God’s fire is a cleansing fire that burns your guilt away and purifies you from sin, sealing within you the work of Jesus Christ. The prophet also suggests God’s ultimate purpose for cleansing us is to prepare us for mission: “Then I heard the voice of the Lord saying, ‘Whom shall I send? And who will go for us?’ And I said, ‘Here am I. Send me!’” (Isaiah 6:8 NIV). Prior to God taking the initiative to cleanse Isaiah, the prophet felt overwhelmed and unprepared for any mission on God’s behalf. After the cleansing, Isaiah is energized with a desire to serve God. Moses was one of the Bible’s most noted leaders. He led the Israelites from slavery in Egypt and then served competently as a priestly leader. He taught them what was God’s will, prayed for them, and even plead their case before God. We need more men like him in the church. But, is it possible that they are already here but have never gotten a chance? Moses was not a gifted speaker and had difficulty trusting God when he told him he would lead the Israelites (Exodus 4). If Moses were alive today, who would he look like in the church? Would he be the person sitting next to you who doesn’t appear to have a “leadership bone” in his body? In fact, could it be you? Ask God to help you see potential leaders through his eyes today. 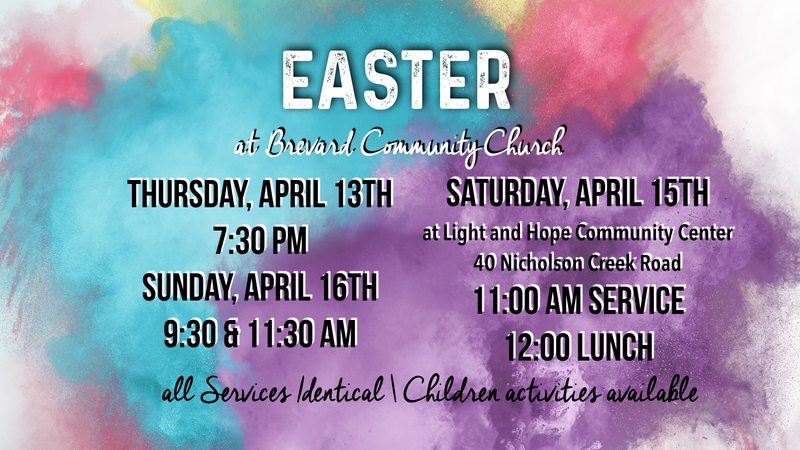 Be an intricate piece of a collaborative prayer effort for Brevard Community Church where believers will pray for every household in Transylvania County by name. Sign up online as a praying neighbor at www.pray4everyhome.com. 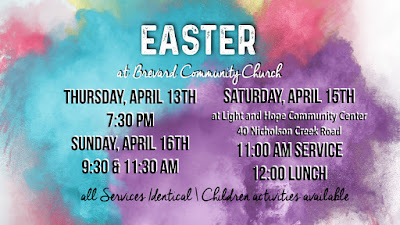 BCC will be offering several Easter services. Who are you going to invite? Saturday, April 15th at 11:00 AM at the Light and Hope Community Center on 40 Nicholson Creek Road. A lunch will be to follow at 12:00 PM. All services will be identical and children activities will be available. Transylvania County Government is sponsoring Back Pack Buddies to help provide for the 350 children in our area who are in need of meals over the holiday breaks. Brevard Elementary School is looking for individuals to help prepare back packs this Thursday, April 13th and Thursday, April 27th. If you are wanting to help, please meet in the Brevard Elementary School Office this Thursday at 12:00 PM. The school counselor will then meet you to show you the process. The church office will be closed in observance of Easter next Monday, April 17th and Tuesday, April 18th.